When looking for a high definition game experience the casual game market does not come to mind. Yet proving how unpredictable and expanding the HD Game scene is, we found not 1, but three HD Games supported by Xbox Live Arcade. Xbox Live Arcade is Microsofts attempt to capture the casual gamer by providing games that have “broad-appeal” through Microsofts Xbox Live service for a nominal fee. 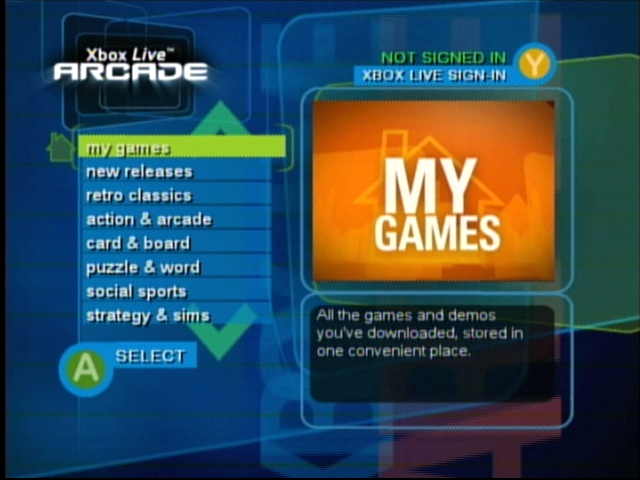 Xbox Live Arcade does not require you to have a subscription to the Xbox Live service to play any game you have purchased or to play any game demo you have downloaded. Xbox Live Arcade does require a subscription to Xbox Live to download additional demos or to convert a game demo to a full version by paying a fee. The purchase price will be billed directly to your Xbox Live account. Microsoft has also promised a new Xbox Live Arcade game will be released each month. Xbox.com :: Xbox Live Arcade :: What Games Are Available? The benefit of the OXM Xbox Live Arcade to people without an Xbox Live subscription is a chance to try the 12 game demos listed above, since even if they got a “retail” version of Xbox Live Arcade they would have no way of downloading additional demos. The benefit of the OXM Xbox Live Arcade to people with an Xbox Live subscription is to save them the hassle and time involved downloading the 12 game demos listed above. Remember if you have an Xbox Live subscription you can download a demo of any game you are missing for free. Note: The playable area of the game is only 4×3, the same as Soul Calibur 2. I found it pretty shocking to see Xbox Live Arcade support anything higher than 480p. Yet looking back at these games I can understand why HD resolutions are feasible when running on a powerful machine like Xbox. With so little processing power being used by the game its not very difficult for developers to support HD resolutions. With Microsoft supporting Xbox Live Arcade on Xbox 360 I would not be surprised if Microsoft required all new Xbox Live Arcade games to support a minimum of HD 720p, although, classic games should remain in their native resolution. I do have one complaint about Xbox Live Arcade, the price for full versions. I would never buy the full versions of these games because of the ridiculous prices either Microsoft or the actual Game Developers are asking ($9.99 – $14.99 – $19.99). In my opinion these games might be worth $0.99 at most. Similar games can be found in the open source game scene for free.